Jupiter reigns supreme and eases conflicts. All hope is permitted, if certain projects are successful, numerous other sectors will be full of questions. The latter will find their answers from now until a few months time. All that touches our environment, close or far is favorable. The Earth signs shelter the passage of powerful stars, this will bring us back to more realistic needs. Also, faster now but just as equally of interest, the combination of Mars-Venus, strengthens its link with our planet and in between our people. The stars give us a considerable perspective. The signs of Fire are always well served, but so are the signs of the Earth and the the sign of Pisces, which benefit from the presence of its planet, Neptune. Thanks to Saturn taking its course in its home, the Capricorn, big but realistic ideals, accompany the wildest dreams. 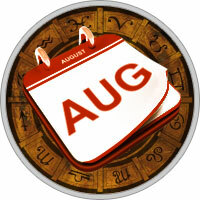 The strong influx that drives this August is solid and constructive. Let us take the time to consider that we can achieve the goal of building our projects one brick at a time. On a personal level, everyone will find something to enjoy. Mercury in Leo from the 12th to the 29th of the month, reminds us that words are a gift that we can all share. Thus, trust is established. Let's enjoy the beautiful light of this wonderful month.